We've added more shipping options, including various postal services for customers residing in AK, AS, FM, GU, HI, MH, PR, PW, VI, and overseas military locations. Additionally, the checkout process has been enhanced with an automatic error correction routine, that will pick an available equivalent shipping method, if you select one that isn't available. Our search engine has been redesigned to substantially increase performance. Also, additional enhancements were made by implementing various caching functions into all areas of the site. Added navigation menus and a "View Cart" link, to the top of the site. Corrected the layout of the site for browsers using resolutions > 800 x 600. Corrected an inaccurate error message regarding the "checksum" of a page, when trying to order certain items. We apologize for any inconvenience this may have caused. The graphical navigation buttons have been removed from the left side of our site, and replaced with text style links. As a result, pages now load substantially faster. Our search engine programming has been redesigned, yeilding a substantial increase in speed and flexibility. Several internal enhancements have been completed with the Online Catalog shopping cart application. You will no longer receive messages about an item already existing in your cart, if you add it again. The quantity will instead be increased. Additionally, error messages will not be shown if you don't enter a purchase quantity, or enter an invalid one. You'll simply be shown the page again and allowed to enter a valid quantity. The check out process has been updated as well. Once you've entered your billing and shipping information correctly, you won't see the Order Form again, unless you specifically request to do so. This will allow you to easily continue shopping around the site and immediately proceed to the final order submission page, when you're ready. Lastly, the shopping application should now detect if you're using a browser capable of secure connections, and automatically direct you to the secure server when submitting your order. A problem with the "Advanced Search" function removing spaces from the "and Mfg. Part # contains" field has been corrected. The Online Catalog Order Form was updated to better assist customers in fixing data entry errors. The Availability section of all item specific pages in the Online Catalog now show "Checking Availability..." for IE users while our warehouses are being queried, then changes to "Availability" after the check has been completed. Item specific pages now display a manufacturer's logo (if available) when an image of the item is not available. A bug in the Online Catalog relating to the "Continue Shopping" button has been corrected. Our search engine has been upgraded to allow for more flexible boolean (and / or) searching, simplified in these easy to understand terms: "match exact phrase", "match any of these words", and "match all of these words." Try it out! We've changed our site with a more up-to-date look. The site is now more compatible with older Netscape browsers. A problem with the search engine returning all possible results on one page, for a simple search, has been corrected. Thanks to a lot of work by our purchasing department, we've negotiated better pricing on the majority of the products we carry, and are able to pass these savings on to you! 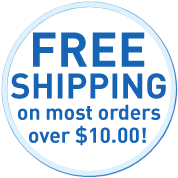 Enjoy free UPS Ground shipping on orders of $550.00 or more! We have also removed the $2.00 handling charge on all domestic orders. We have completed individual pages for each item which display availability, specifications, product brochures, and an image of the item (soon). These pages are accessible by clicking the [Details] link next to each item. The Online Catalog Order Form has been simplified for Internet Explorer users, to only display entries which are required for the payment method selected. An issue with product specifications being incomplete has been resolved. An issue with the Online Catalog stating that an order couldn't be revised after checking out, when no order was placed, has been corrected. The Online Catalog has been upgraded to include better navigation, easier searching, and more items. The Online Catalog has been upgraded to display estimated shipping (for certain shipping methods), as well as handling, before entering all of your billing information. We hope our customers will enjoy this substantial enhancement. We'll be adding estimating for all of the shipping methods we offer as time allows. When submiting your Order Form online, the Online Catalog will no longer go to a separate screen for any mistakes that you've made. The Order Form will automatically reload, with any errors listed at the top. Our Search Engine has been improved, to allow searching only within a particular product category, if desired. A formatting error in our real-time stock program was making availability results unreadable for our secondary warehouses, if our primary warehouse server was down, or had shut down for the evening. This has been corrected. The Online Catalog ordering system has been upgraded with more shipping options and more information about them. Also, we think the bug which would occasionally cause nothing but a blank page to be displayed after billing and shipping information had been submitted, has finally been fixed. Lastly, billing and shipping information is now displayed on the final page shown, before submitting an order. This will better assist you in verifying your information before submitting an order. You can no longer supply a FedEx account number, without picking a FedEx shipping method. IMPORTANT UPDATE: Any specifications we have on products can now be viewed online! You no longer need to call or email us for information we have on the products in the Online Catalog. If specifications are available for an item, you can view them by clicking the "More" link, next to the item description. If there isn't a "More" link, then we don't have any additional information on that item, and you should contact the manufacturer for more information. Due to human error, all pages in the Online Catalog were erased early in the morning, Saturday, 1/8/00. The catalog was successfully regenerated by 1:00PM EST that day. When the Online Catalog is being updated, you'll no longer get an error message saying "The page you requested (page name) is not available." Instead, you'll be told that the catalog is being updated and the page you requested will be available shortly. A small problem with the date format being shown on auto-generated receipts has been corrected. We've added real time stock checking capabilities to our Online Catalog, for our primary warehouses. You can check real-time stock of an item, by clicking the Item Number. We also have additional warehouses which are not yet available for real-time stock checking, so we urge you to contact us for availability on an item that may appear to be out of stock. Products which are discontinued or phased out, have never been intentionally listed on our site. This has changed and we are now offering these products, provided stock is available. These items are notated with either "(NO RETURNS / PHASED OUT)" or "(NO RETURNS / DISCONTINUED)." If you check stock on any of these items, and none are available, then we've sold out of them and will not be getting any more. They will also be removed from our web site the following day. Product pricing on the website is now updated twice daily, at approximately 5:00 AM EST and again at 12:00 PM EST. IMPORTANT NOTICE: Our offices will be closed on Monday, September 6th in observance of the Memorial Day Holiday. IMPORTANT NOTICE: Our offices will be closing on Tuesday, August 10th at 2:00 PM EST and reopening on Thursday, August 12th, at 10:00 AM EST, due to system upgrades. During this time period, we urge you to place your orders via our website or Fax Order form, and use the manufacturer's websites to answer your product questions. All orders, email, and voice mail will be handled promptly on Thursday, when we reopen. Bottom Line Telecommunications is changing our website address to ICHQ.Com. In the near future the web address, Domain-Mart.Com, will no longer exist. You can easily remember us as the "Internet Computer Headquarters" - ICHQ.Com. Our offices will be closed on Monday, July 5th, in observance of the Independence Day holiday. Be sure and check out our Cisco and 3COM product offerings. Our Connecticut office will be closed on May 31, in honor of the U.S. Memorial Day holiday. You may contact our Florida office at (561) 791-3308 for any assistance you require. The Online Catalog order form will now retain your basic information for up to 1 year from your last order, so when ordering again, the majority of questions will already be completed. Check out the latest Specials, where you'll find Nikon's Super Coolscan 2000 LS-2000, and Coolscan III LS-3 available, with a $150 manufacturer's rebate! FedEx Saturday delivery is now selectable for the USA. You can select this option in the order form, on Thursdays after shipping hours, and during shipping hours on Friday. A minor bug was created when we introduced this option, which was preventing selection of the service. This problem has been corrected. Same Day Delivery Now Available! You can have your order delivered in the continental U.S.A., the same day, if placed Monday through Friday, before 2:00PM Eastern Standard Time. The Online Catalog displays a flat rate of $200 for this service. Actual shipping costs may be substantially less. We will contact you by email before processing your order, to confirm shipping costs, and availability of this service to your area. Check out the latest Specials, where you'll find Panasonic's LC50S, E110, S110, P110, and SL90 at unbelievable prices! We are aware that the site has been down frequently due to heavy load, and as a result have changed servers. We apologize for any inconvenience. Try our all new Search Engine, where you can list specific manufacturer products, price shop, and more. Check out our featured manufacturer, Best Power, and their great line of products! Check out the latest Specials, where you'll find LANCAST's Twister 7000-22 on sale. Don't miss the chance to pick up this great item at a terrific price! Check out the latest Specials, where you'll find In Focus' LP225, LP725ZV, LP735ZV, LP735WS, and LP425 on sale. Don't miss the chance to pick up these great items at terrific prices! Check out the latest Specials, where you'll find the Diamond Monster Sound MX200 on sale for $137.95, and Cisco memory equivalents for far below SRP! HUGE SALE!! Get everything you can between now and Sunday, June 14, 1998. Most every item is on sale! And when these prices are gone, they're gone. Sale starts Friday, June 12, at 8:00PM E.S.T, and ends Monday, June 15th, at 7:00pm E.S.T. We've added a new Specials page, with great deals. In specific cases, the system would not allow you to reach a final Place Order screen. It would, instead, continue to loop back to the contents of the Shopping Bag. We have found, and hopefully, corrected this problem. Please contact us if, after filling in your shipping information, you are not able to reach a screen containing a "PLACE ORDER" button. We have found and corrected the poor performance of the site experienced by many users. If the site is running slowly for you, or you are experiencing timeout errors, please let us know. We are aware that the site is running extremely slow for many people, and are hard at work on correcting the problem. Please bear with us. You can now review Past News items, from the previous months. The "Tech Info" links were incorrect as of January 5th, and have been corrected, and are now functioning properly in the Online Catalog. We've added a new page in the Online Catalog, called "The 50 Most Wanted Items", which contains our all-time, best selling products, which are still in existence. Have a look, and you just may find what you've been looking for! An error was occurring if you had partially placed an order in the Online Catalog, then came back later and tried to complete the order. This problem has been corrected. Pages in the Online Catalog containing items now display a link back to the category which contains those items. More user recommended changes have been implemented in the ordering process. Our order form now displays information you have already entered (a problem for IE users), if a mistake is made, or a different page on the site is viewed, and you return to the order form. We are working on having the order form already partially completed for repeat customers. Word wrapping now functions properly for Netscape users on various entry forms, and the Online Catalog order form. As a result of some testing that was taking place on 12/17, you may receive a Transmission Error 0 from the Online Catalog. Restarting your browser should correct this problem. If it does not, please e-mail us for the method of correcting this on your end. Many of the e-mail links in the FAQ, and in various parts of the website were not functioning properly for Netscape users. This has been corrected. We have listened to you! Arriving at one of our Online Catalog pages via a search engine like Infoseek, AltaVista, etc., now allows you to start shopping on that page, with minimal fuss. Thanks to the folks who were kind enough to let us know how much we needed this! The results of the Online Catalog's Search function were not displaying for Netscape 3.x users. This has been corrected. Technical information on certain products is now available directly from the website, in lieu of e-mail. Most files are in .PDF format (Adobe Acrobat), and are stored in ZIP archives. You will need PKZip, WinZip, or some such similar utility to extract the Acrobat files, and you will need Acrobat Reader to view them. We will be adding more of these as time progresses.